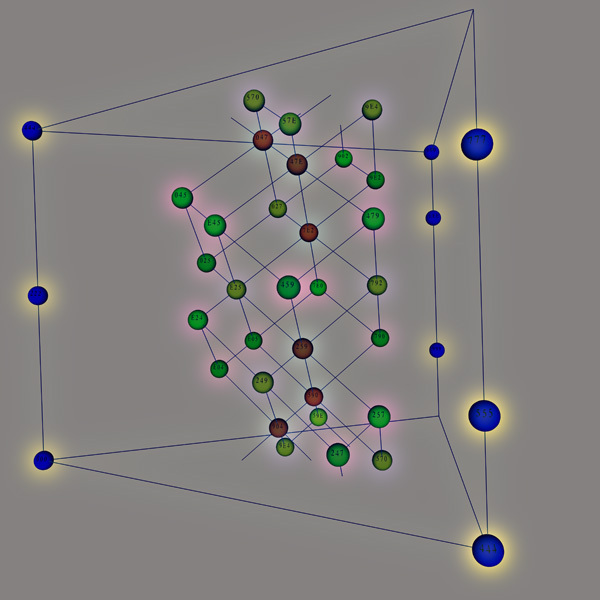 ChordGeometries represents chords and voice leadings in a variety of 3D geometrical spaces. You can enter chords on a MIDI keyboard or using the Keyboard window. Voice leadings between successive chords are represented by continuous paths in the spaces. The program is meant to accompany the paper "The Geometry of Musical Chords" [Science 313 (2006): 72-74]. Further information can be found in "Generalized Voice-leading Spaces," with Clifton Callender and Ian Quinn. Three movies demonstrate the program, using the opening of Chopin's E minor prelude. The first shows Chopin's piece as it appears in circular "pitch class space." The second shows how the two pairs of voices chart a path on a Mobius strip. The third depicts Chopin's piece as it travels through a slice of the four-dimensional space containing seventh chords. You can also watch Deep Purple on the Mobius strip. ChordGeometries Demo: Chopin - Circular "pitch class space" from Dmitri Tymoczko on Vimeo. ChordGeometries Demo: Chopin on a Mobius strip from Dmitri Tymoczko on Vimeo. ChordGeometries Demo: Chopin through four-dimensional space from Dmitri Tymoczko on Vimeo. ChordGeometries Demo: Deep Purple on the Mobius strip from Dmitri Tymoczko on Vimeo. WARNING: It got too hard to support the standalone applications, so I have started distributing Max/MSP source code instead. To install, download Max/MSP/Jitter from cycling74 (there is a free runtime version). Then install the Lobjects from Peter Elsea. Then set the filepaths and run ChordGeometries.maxpat. It might take some fiddling but it should work.